The Abril Mine is an old zinc and copper mine located high on the western slopes of the Dragoon Mountains in southeastern Arizona. 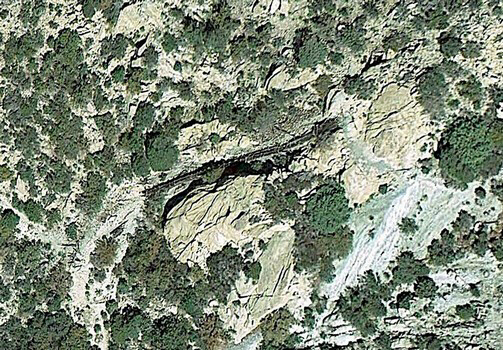 I discovered its location while doing a "flyover" of the mountains using Google Earth. What caught my attention was the appearance of the linear structure in the GE view below. When I plugged the co-ordinates of the structure into my gps, its software identified the location as the Abril Mine. I was able to find the following info on the old mine from Mindat.org: " Workings include 5 adits, tunnels on 5 levels, numerous stopes and winzes. Tunnels open at elevations ranging from 5320 feet to 6441 feet." Lynn Bailey's Book "Mines, Camps, Ranches, and Characters of the Dragoon Mountains" has a good description of the history of the mine. 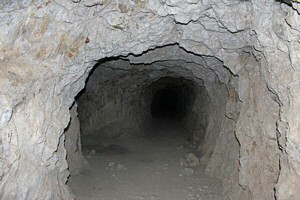 According to Bailey, the mine's name came from two Abril brothers who took over the claims in the area in 1915. Apparently, little work other than assessment work was done until the 1930's when production from the mine really commenced. Production peaked in the years from 1946 to 1950 when 30,000 tons of bornite(copper) and zinc ores were shipped to a custom mill in Bisbee. By 1953, the mine was pronounced exhausted. But in the early to mid 1960's another operator shipped approximately 40 tons of copper and zinc ore.
Mr. Bailey also identified the long structure that I had seen in the Google Earth photo and explained its existence. "Because the access road from Sorin Camp was so dangerous for passage of trucks, ore from the Abril-Smith Mine was chuted down the side of the mountain to Slavin Gulch, where it was loaded in trucks and transported to Bisbee." The Google Earth view, put together with what else that I had learned about the old mine prompted me to take two trips to the area. The first was a drive into the mine, and the second, a hike on the old abandoned haul road. The original road into the mine is now designated as Forest Road 345A. It leaves the Middlemarch Road just north of Middlemarch Pass. There are several rocky areas to negotiate along the way. A severely rutted stretch of road leading up to Soren Pass will definitely require 4wd. I appreciated having a rear locker in my Tacoma to navigate the road. From Soren pass on to the mine, the road is a very narrow shelf road with a long, steep drop off to the side. That section of road would not be one to meet oncoming traffic! The views out to the west from Soren Pass are spectacular. Across the San Pedro Valley to the northwest can be seen the Rincon Mountains and the Catalina Mountains near Tucson. Due west are the Whetstone Mountains and the Mustang Hills. Mount Wrightson of the Santa Rita Mountains can be seen peeking over the Whetsones. One can also look down into the rocky Slavin Gulch and the former haul road that once snaked its way up to the base of the Abril Mine. The 345A road ends abruptly at the upper levels of the Abril mine workings. There is no real turn-around at the end of the road. I would suggest parking back from the end of the road a few hundred feet. The site of the two photos below would be a good parking area. 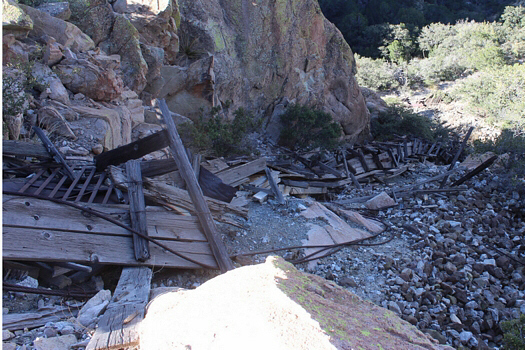 About all that remains at the Abril mine site today are several concrete foundations, the mine dumps with their associated workings and the remains of several other wooden structures besides the ore chute. One report mentioned that in addition to the chute a system of cable cars may have also been used in the transport of the ore. The wooden "tripod" seen in the photo to the lower left below may have been associated with that system. There is a very long, heavy duty steel cable lying on the ground nearby that also may have been part of the tram system. The long ore chute is not visible from road level. The lighter colored material on the various dumps is limestone, the country rock of the Abril Mine. Because of their light color, the dumps can be spotted from a long ways away. I poked into one of the adits a short distance. Once away from the portal, there seemed to be little downfall. The one adit split off to both sides to several old stopes. It was not obvious to me how to maneuver down to the lower levels of the mine visible below the road. If there ever was a pathway, no evidence of the route remains today. It was a very tricky scramble for me to get down there! The lower dump is obviously associated with a water-filled adit. It appears that there was once a mine track installed on the dump. That rail line ran several hundred feet over to a large granite rock formation. Crossing over to the rocks showed the reason that the miners had gone in that direction. At the end of the old rail bed, there is a natural rock chute that cuts down through the rocks. The miners had taken advantage of that opening to construct the wooden chute that shows up in Google Earth. The rock chute provided the slope and the support needed for the wooden structure. There were additional anchoring cables extended out to the sides to help keep everything from sliding down the mountain. The chute was apparently covered at one time and had been lined with thin steel plates. The ore materials must have really scooted down that slide! Trucks driven up from Slavin Gulch were loaded at the base of the chute. It is not evident how people moved from the top of the chute down to its bottom. If there was ever a dedicated pathway, it is no longer evident. Just as it was difficult to maneuver down from the road to the top of the chute, it was equally challenging to find a route down from the top to the bottom of the old structure. After poking around the base of the chute, it was time to conclude this visit to the Abril mine. The climb back up to the road and the vehicles was quite strenuous! The photos below were taken on our exit from the area. The photo on the left shows the nature of the shelf road from the mine back to Soren Pass. Going down the rutted section of the road on the southside of the pass was quite exciting! In some respects, traveling down the road was more difficult than having come up it. I banged the undercarriage of my truck several times on the return trip dropping off the rocky ledges. A week or so after driving into the Abril Mine, I walked the old haul road in Slavin Gulch from its trailhead to the base of the old ore chute. The road is now blocked off to vehicular traffic and is designated as the Slavin Gulch Trail #322 open to foot and non motorized traffic. The trailhead is along side Forest Road 687 a little more than 2 miles from the junction of 687 and Forest Road 345. The Slavin Gulch trail ends at the base of the ore chute at the Abril Mine, a distance of approximately 3.6 miles from the trailhead. 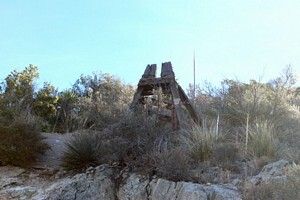 The Abril Mine located near the summit ridgeline of the Dragoons is sited in limestone. The rock type seen along Slavin Gulch is granite. 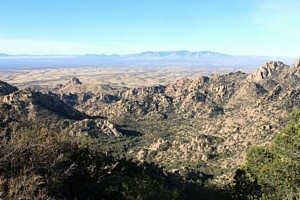 It is the landforms and the scenic views associated with the granite that the Dragoon Mountains are best known for. The granite "castle" in the lower right photo stands tall near the mouth of Slavin Gulch. The parallel vertical fracturing of the rocks and the erosion along those lines have created interesting pillars and "balancing rocks" formations. The interaction of light and shadows also created interesting effects. The old roadway has sections that have seriously deteriorated and in several places appears to be more "path" than road. But for long stretches, the roadbed looks like it could easily be put back into service. From the nature of the fill rock along the road's edges, it is apparent that quite a bit of blasting had to be done to create the road. For most of its length the old road in Slavin Gulch has a moderate grade, but closer to the mine it steepens dramatically. It probably was not a lot of fun to come off the grade below the ore chute in a heavily loaded truck. The only artifact related to the old mining activity that I noticed along the Slavin Gulch trail prior to arriving at the ore chute were the remains of an old cabin. It was not any easier climbing around the old chute the second time!